I had a fabulous time at the Pagan Federation London Conference yesterday - it was a friendly event with great talks and workshops, lots of lovely stalls and a well-stocked bar. It was also in a great venue - the Leytonstone Business School, which you can see in the photo above. Leytonstone wasn't a part of London I had visited before and I was imagining the business school being used for this year's event would be a dull 1960s concrete structure - I couldn't have been more wrong. 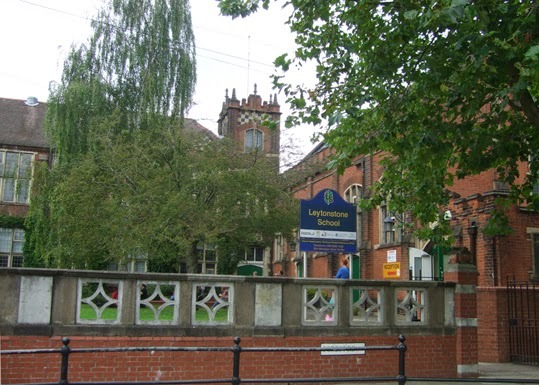 The building is a delightful old school built of red brick with a superb main hall and big classrooms that were the ideal size for the talks and workshops. Of course, I am old enough to feel a touch of nostalgia for school days - maybe those who have recently left education would be less enamoured of the place - but I would have no objections if the PFL uses the same venue for its conference next year. When I got the programme late last week I was delighted to learn that my own talk - Psychogeography: Pathways into the Visionary City - was among the first of the day. That meant once I'd finished I could relax, enjoy what other people had to say and have a nice cider at the bar at lunchtime. There were actually too many interesting things to go to, with at least three different lectures, workshops or entertainment taking place at any one time. After my talk I stayed in the same classroom to hear Yvonne Aburrow speak on gender and sexuality in contemporary Paganism: how we got to where we are, and where we might go next. However, I was very sorry to have missed Carrie Kirkpatrick demonstrating crossroads magic and Andrew Rea explaining magic in Anglo-Saxon England. After lunch I went to a fascinating runes workshop with Katie Gerrard, but those who tried out shamanic trance and dance with Marielle Holman said that was also superb. I had heard Caroline Wise talk about Elen of the Ways in the past and I know she gives a fascinating presentation, but if I could have been in three places at once I'd have happily heard her again. Later in the day I went to talks on Kabballah’s Tree of Life by David Benton and the path of Chaos with Mark Vincent - both very informative. In the evening there was a performance of Aleister Crowley’s The Rite of Jupiter - loosely based on the ancient Greek Eleusinian Mysteries. We don't know exactly what went on in the original Eleusinian Mysteries, but Aleister Crowley devised a series on plays, including The Rite of Jupiter, inspired by his interpretation of what they might have been like. The Rite of Jupiter was originally staged in 1910 and this was a rare chance to see a new performance. It was interesting, and the acting was good, but I would have to comment that I don't think Uncle Al was really a great playwright. Having such a good time at the PF London Conference reminded me that Witchfest 2014, in Croydon, is also coming up - on November 15. A friend told me that the last day to by earlybird tickets for Witchfest is today, Sunday 31 August, so I've just bought mine and am looking forward to it. Caroline Wise wasn't present to give her scheduled talk. I went to Mrs Mary Rands' talk on bereavement of a magickal partner. It was accompanied by a recording of her husband's funeral. She showed us how to organize the leave taking of a Craft initiate and was very generous in sharing with us what is of course a personal and extremely difficult life experience, so that we may begin to think and prepare. Vivienne - yes I certainly remember us chatting over the soaps on Steve and Jacqui's stall. Nice to meet you. Unknown - sad to hear that Caroline's talk was cancelled, glad Mary's talk was interesting.